With the big red flag, this place is hard to miss. The place is really casual and very friendly. 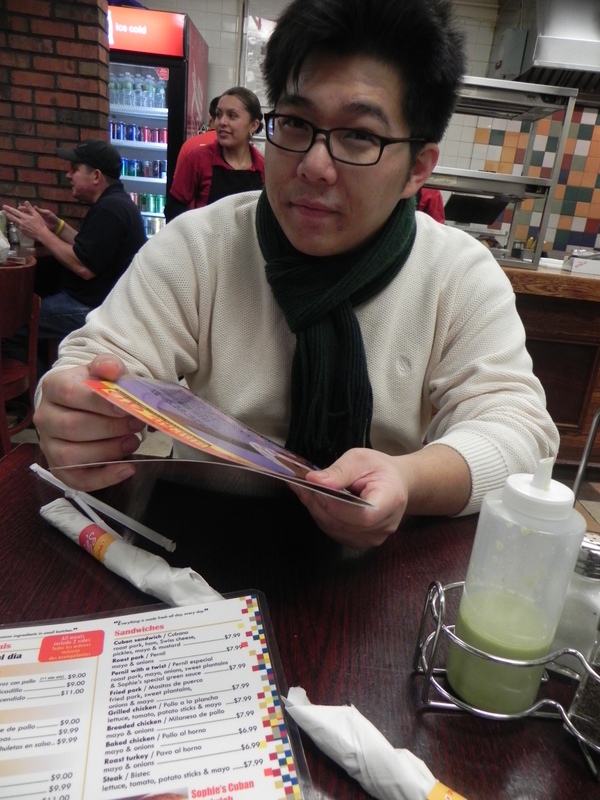 Although there are no fancy plating or fancy decor, the place is worth visiting and is a very popular lunch joint. It was crowded with people shoving the cashiers with money in exchange for the delicious food. If you’re in the area and looking for a quick bite to satisfy your taste buds as long as your wallet, this is the place to go. The outside and inside of this restaurant isn’t appealing. The atmosphere within the restaurant is noisy and hectic. I’m going to warn you though… the food is EXTREMELY OILY. So don’t come crying back to me when you find a pimple the next day. 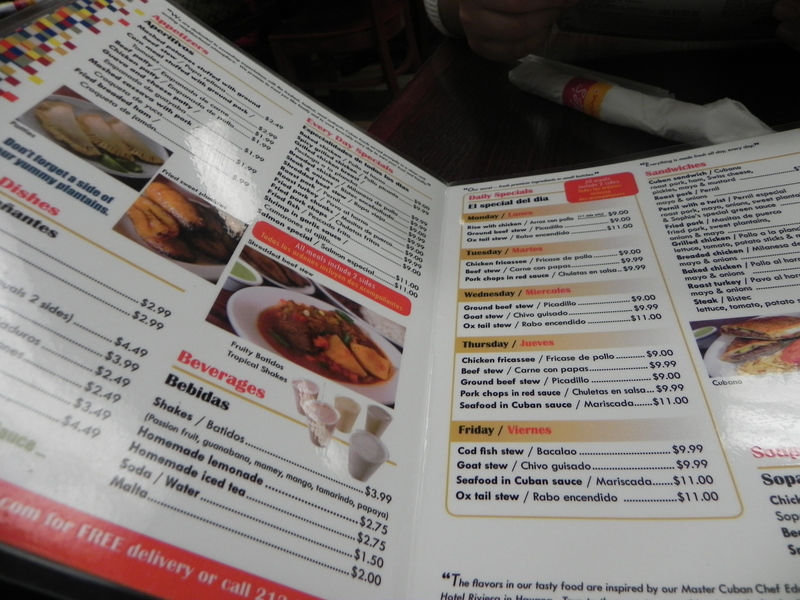 But what really captures our interest in this restaurant is the AMAZING food here and it’s relatively CHEAP too. In less than 5 minutes of ordering, our food was already on our tables. It’s almost as fast as fast food, but better! The waitress may be hard to understand and may mix up your order, so make sure she doesn’t give you the wrong thing! But nevertheless, the ordering mistake turned out to be delicious. We originally wanted beans, but we were given plantains and I DO NOT REGRET IT one bit at all. We ordered a Baked Chicken Meal and a Pulled Pork Sandwich with a twist. Both very delicious dishes that were recommended by others. The baked chicken was juicy, tender, and mouth-watering, even though it oozed of oil. The skin of the chicken was sweet and seasoned very well. The rice was delicious too, but I suspect it was cooked in butter and oil because of how thick and smooth it was. 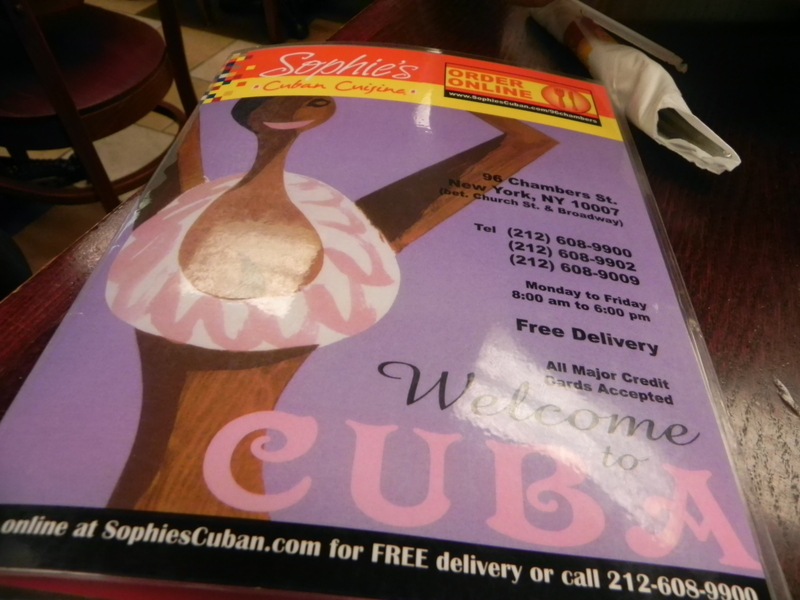 It came with a side of plantains…. and they were probably the BEST plantains I’ve ever had so far. It’s like a mix of having the sweet taste of bananas with the texture of a potato. The pulled pork sandwich was pretty darn good too! It had a very smokey flavor and it had plantains too!!! They had this green sauce too! Not sure whats in it, but I think it has cilantro. It’s sweet and tangy and adds a good kick to the sandwich. The pork was a bit dry, but it was definitely enjoyable. Overall, I would definitely check this place out. Not the greatest place if you’re looking for a romantic atmosphere, but it has some delicious food! SO GOOD. SO MUCH FOOD. Vic and I came here after my work session at Euphoria Spa and tried the recommended dishes and was not disappointed at all. Although the staff was a bit rushed because there were many customers, they seemed tired and over-worked but still served us on time. It was great! They were very fast and good workers. All food had many flavors sunk into it. We had the baked chicken with side of yellow rice and plantains. The plantains, I was a bit afraid to try but they were delicious too!! As you may know, I am more of a potato person and I was reminded often that the plantains tasted like potatoes! But maybe even better! We were actually going to get the beans but the waitress misunderstood me. She gave us plantains with the yellow rice. The rice was so oily but it was oily goodness. I wish the baked chicken had a bit more meat in it though. 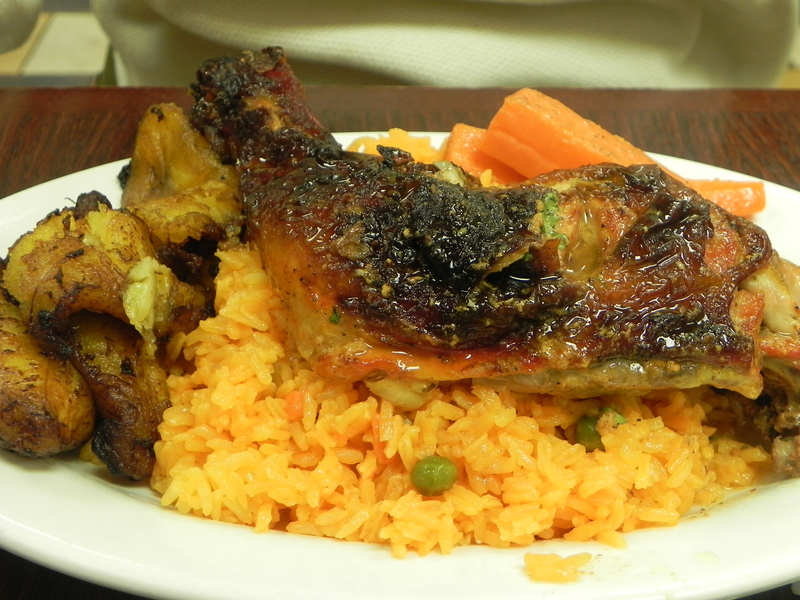 Posted on February 4, 2013 February 4, 2013 by pinkytwinkieeePosted in manhattan, New YorkTagged baked chicken, cheap food, city, cuba, cuban food, dining, food, lunch, New York, pernil, restaurant, roast pork, sitting area, tribeca.